The latest Sync provides Web-based data without a navigation screen. LAS VEGAS — Upgrades to Ford Motor Co.'s Sync system, unveiled this month at the International Consumer Electronics Show here, bring more than new features. They alter the way car companies, traditionally slow to roll out new products, adapt to the rapid changes common in consumer electronics. 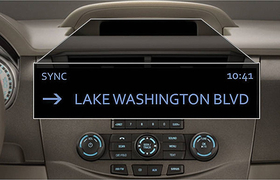 Sync 3.0, available later this year, will provide audible turn-by-turn navigation and data such as traffic information, news, sports and weather without requiring a navigation screen. More important, experts say, the latest version from Ford and software partner Microsoft means the ability to upgrade Sync's content won't be limited by the hardware in the vehicle, because much of Sync's intelligence is "offboard," on Web servers. The vehicle taps into the servers through a Bluetooth-equipped mobile device carried by the driver. No more swapping out CDs to update navigation data. "The idea of offboard is that all of the routing computations, the searches and everything are done outside the car," said Robert Rennard, chief technology officer at Telenav Inc., a Silicon Valley supplier of navigation services to wireless providers. It also will provide those services to Sync. The driver requests information verbally. Sync uses technology from Airbiquity Inc. to move the data from a server to the driver's phone. That mobile device relays the information to the vehicle. Sync users will be able to go online and store favorite destinations, routes and other preferences, such as favorite sports teams and the types of news they would like to receive. Up-to-date personalized information then is delivered every time the cell phone connects to the Internet. "This model of a lot of intelligence in the car, and a lot of intelligence in the Internet, exchanging data, I think is absolutely the model moving forward," said Bryan Mistele, CEO of Inrix Inc., the company that supplies real-time traffic and routing data to Sync. Gartner analyst Thilo Koslowski said the economy will make offboard telematics desirable for automakers. TomToms navigation unit is removable from its dock. "This is almost telematics 2.0, leveraging an existing device that consumers have, and existing data plans, rather than trying to reinvent the wheel," he said. "If you can offer telematics service without charging a lot of money, that's exactly what you should do." Koslowski and other experts say the offboard approach is likely to gain momentum, but automakers probably will keep installing built-in devices. And portable navigation devices are likely to continue being sold in stores. A hybrid approach to portable navigation could emerge: an embedded system that can convert into a portable one. Dutch navigation device maker TomTom International BV and Japan's Fujitsu Ten Ltd. combined for such a system. A TomTom navigation unit rests inside a docking compartment in the vehicle's instrument panel. When docked, the unit functions like an in-dash navigation system, with audio playing through the vehicle's sound system. Users can pop out the navigation unit and use it in another vehicle. "This is embedded and portable at the same time. This defines a new category," said Wolfgang Reelitz, TomTom's vice president of automotive sales. Toyota sold an earlier version of the TomTom docking system last year in the 4Runner SUV.